One of the conjectures found in common-ancestor evolution is that humans and chimps shared kinfolk a few million Darwin years ago. Supposedly, the primary evidence for this was chromosomal fusion, but there are many reasons to reject this concept. Further research shows additional complications for the idea. 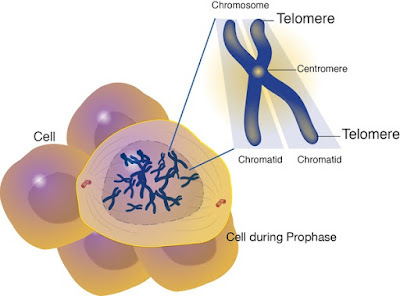 Those telomeres at the ends of chromosomes are where the chromosomes fused, but now it's been discovered that they are found throughout the inner parts of chromosomes, and not just at the ends. Evolutionists claimed "genetic mistakes", but that idea got plopped onto the trail. The specialized sequences show the genius of the Creator and are further evidence against evolution, and creation scientist Dr. Jeffrey P. Tomkins is conducting further DNA sequence research. The prevailing evolutionist mantra holds that humans and chimpanzees share a common ancestor that lived about six million years ago. One of the most cited evidences for this belief is the alleged human chromosome 2 fusion site. There, evolutionists claim, one can see the degenerate remnants of where two telomeres fused, which they say are leftovers from humans’ evolutionary descent. Telomeres are specialized DNA sequences found at the ends of chromosomes in plants and animals. They are uniquely designed to make possible the existence of more-complicated forms of cells that have large linear chromosomes—contrasted with single-cell bacteria that have less-complex circular chromosomes. To read the rest, click on "Internal Telomere-like Sequences Are Abundant and Functional".